60 pages. 35 color/3 black and white reproductions. Clothbound. Published on the occasion of the exhibition Paintings from the 1970's, by Andy Warhol. 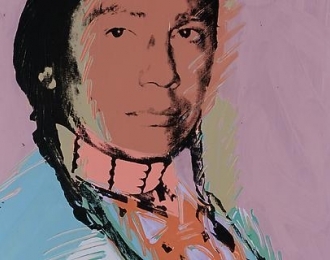 Amassed in this show is a group of works which touch upon what Warhol did best, the abstract Oxidations and Shadows, and the iconic Ladies and Gentlemen, Mao and Russell Means. 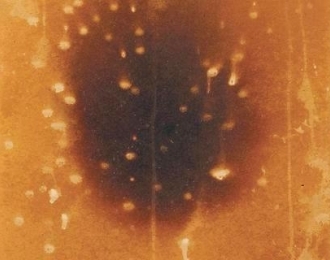 On one hand, there is Warhol at his purest and most ironic: the Oxidation paintings in which Warhol combined his or who knows whose urine and metallic copper pigment on canvases which resulted in these abstract oxidized masterpieces that dabble at the ever present question of authorship in his work. On the other hand, there is Andy at his most luscious; contrary to the glamorous celebrity portraits, the Ladies and Gentlemen portraits thrive within their anonymity, making a rich and lavish yet extremely personal portrait of New York’s diverse drag queen community.